EMPIRE, Michigan — It’s winter in Northwest Michigan, the coldest and deepest season of ice and snow in years. It’s possible that the severe winter will produce the conditions necessary to curb the newest noxious and unsightly threat to the region’s waters: the algae blooms overtaking northern Lake Michigan and Sleeping Bear Dunes National Lakeshore. The blooms not only illustrate the presence of rising levels of nutrients in the water. They also are evidence of the weakening resolve of citizens, their state, and the nation to secure America’s clean fresh water. Write me – keith@circleofblue.org – if you’re interested in organizing to halt this frustrating risk to the national park in our own backyard, and to addressing this insult to our lakes and rivers. No place in the United States, it seems to me, is a better place to start. In 1970 the United States Congress authorized land purchases to establish Sleeping Bear Dunes National Lakeshore — 35 miles of towering dunes, broad forests of maple and hemlock, and magnificent shallow blue bays along the northern Lake Michigan shoreline west of Traverse City. In almost every way conceivable, Sleeping Bear’s founding reflected the best impulses of a nation determined to prove that economic development could coincide with new measures to conserve land, and scrub the air and water clean of multiple pollutants. The 71,000-acre national park, founded at the very center of the five Great Lakes, met two primary national goals. Sleeping Bear restored the deteriorated bounty of soil, forest, and water that supported, into the early decades of the 20th century, a necklace of tiny maritime communities and several thousand fishing, farm, and forestry jobs. And second, Sleeping Bear helped to prove that a new and much larger economic sector could be formed from policies that preserved a region’s ecology, limited pollution, and effectively enforced environmental law. In the course of two generations, the air and water in and outside the park were largely cleared of pollution and improved to near pristine quality. Rivers in and outside the park grew colder and clearer, supporting active salmon and trout fisheries. Forests in and outside the park grew taller, more dense, and more supportive of wildlife, including regular sightings of bobcat, bear, goshawks, and once-endangered bald eagles. In effect, the joining of land conservation, natural restoration, and environmental regulation yielded a Northwest Michigan environment that is in its best condition in over 130 years. And the region’s economy, with Sleeping Bear as a mainstay, has never been as large, diverse, and innovative. The recreational and tourism industry, a major business sector, supported 12,000 jobs in Northwest Michigan in 2012 and generated $1.2 billion in economic activity, according to the latest assessment by the Anderson Economic Group. Still, despite such manifest evidence of the value of public policy to simultaneously restore ecological values to develop new wealth, the state and federal environmental laws that underlie Northwest Michigan’s natural beauty and Sleeping Bear’s success as a tourist destination are continuously under attack in county governments, the state Legislature, and in Congress. The result is that solving new threats is more difficult to achieve in the United States than at any time since the modern environmental era began six decades ago. My colleague at Circle of Blue, Codi Yeager-Kozacek, published a must-read piece a week ago on algae blooms and their cause as part of our Choke Point: Index project. Algae blooms, she reports, are caused by phosphorous, a single water pollutant, much of it produced from a single source – agriculture. In the 1970s, the Great Lakes states and the nation enacted water quality laws that identified and acted to dramatically reduce water contamination from multiple pollutants and multiple sources. Yet even as the algae threat has expanded in recent years, the Great Lakes states and the nation have shown no comparable technical or political capacity to reduce an unsightly and increasingly dangerous shoreline mess. The summer algae blooms in Sleeping Bear Dunes are disease vectors for avian botulism that finds its way into Gobi fish, the small exotic invaders that are overtaking Lake Michigan. Migrating birds, especially loons, feed on Gobi. In 2012 hundreds of loons died on Sleeping Bear’s beaches from avian botulism. Last summer dozens of dead loons perished in Sleeping Bear. People wring their hands and cry in anguish. But little is happening to slow the flood of phosphorous and other nutrients into waters that give rise to the toxic algae. It wasn’t always this way. 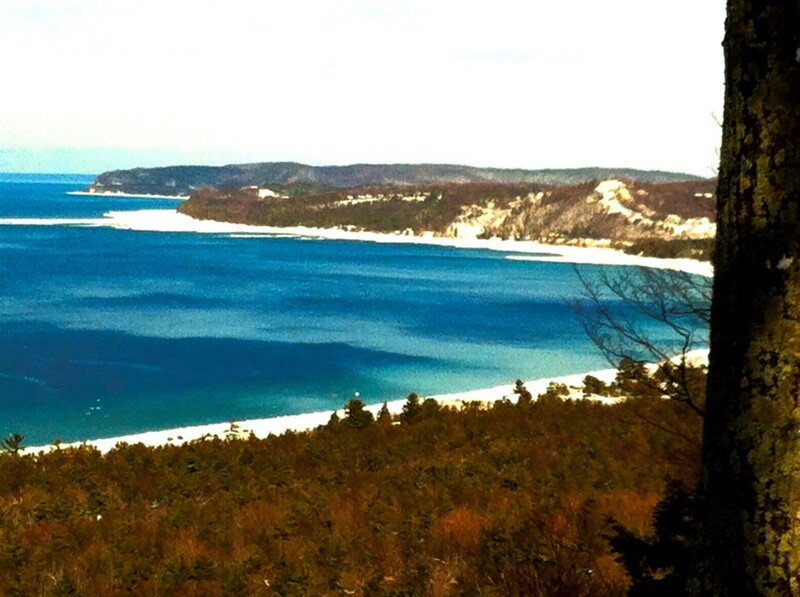 Four decades ago Americans summoned the intelligence and moxie to clean up the air and water, and protect beautiful places like Sleeping Bear Dunes National Lakeshore. What value those steps provided. In the decades prior to 1970, the great pines of northwest Michigan had fallen to the chain saw, agricultural practices grew obsolete, and chemical and sewage pollution fouled the region’s bays. Jobs withered and the air of prosperity slowly leaked out of the coastal towns. All of those trends, though, began to head in a much different direction in 1970. Along with Sleeping Bear’s founding, 1970 was also the year of the first Earth Day, the year that Congressional leaders and a Republican president recognized an ecological and public health emergency and embraced a national economic goal to restore the land, and clean up the air and water. During the greenest decade in United States history, federal and state lawmakers and presidents of both parties worked in bipartisan collaboration to pass legislation to establish new parks and preserves, invest in pollution control equipment, prompt industries to develop safer operating practices, and provide sufficient revenue for courts to enforce regulations. None of this should be surprising. Policymaking, after all, reflects a society’s capacity to manage itself, and a measure of its ambition. New policy represents a nation’s courage to act on big problems. Keeping old and ineffective policies in force, though, is another way of signalling a society’s willingness to retreat. Algae fouls the water and mars the beautiful beaches of Sleeping Bear Dunes National Lakeshore. Loons are dying. Nature summons attention to changing conditions. The question is this: Do we still have the courage to respond?